Mr. Mereness most recently became a shareholder at Giometti & Mereness P.C. John Mereness was born in Montana and attended Trinity University in San Antonio, Texas, where he obtained his bachelor’s degree in 1993. Three years later he obtained his J.D. from St. Mary’s University School of Law in San Antonio, Texas with honors in 1996. John began his legal career in Texas from 1996-2001, focusing his litigation practice in insurance defense (including auto, trucking, and oil and gas injury and death cases), insurance coverage, and construction disputes. John and his family moved to Colorado in 2001 where he continued his practice focus upon construction disputes (including arbitrations lasting 5 weeks), mechanic’s lien disputes, surety claims, insurance defense litigation, coverage and bad faith litigation, as well as construction contract negotiations, and is a member in good standing with the American Bar Association, the Colorado Bar Association and the Denver Bar Association. John has a strong and proven background in construction disputes and commercial litigation, and has successfully negotiated numerous multi-million dollar business critical contracts well in excess of $100 million. John also has a notable background with jury and bench trials, and has been a vital asset in resolving complex multi-million dollar arbitrations. 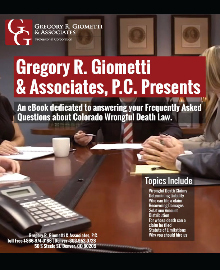 He has published appellate cases in Texas, Colorado, and Virginia, and given construction and insurance speeches in Las Vegas, Nevada. When not at work, John and his family take advantage of the many great activities offered by Colorado’s great outdoors, especially fly-fishing. St. Mary’s University School of Law, San Antonio, Texas, 1996 – J.D. Trinity University, San Antonio, Texas, 1993 – B.A.